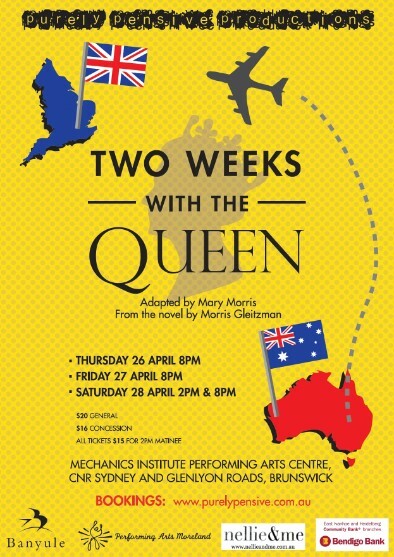 Two Weeks with the Queen was presented by Purely Pensive Productions on April 26, 27 & 28, 2012 at the Mechanics Institute Performing Arts Centre, Brunswick. Colin has a mission. He wants to speak to the Queen about his brother Luke who has cancer. Cousin Alistair would like to help but stress brings on his dandruff. Colin takes the lock off the back door and goes out alone…. Two Weeks with the Queen is a classic Australian comedy which explores issues of love, loss and the way we treat other people.